Somewhere in the past, I lost the beauty of Silence. School, work, relationships, pets, money money money, all drowned out an appreciation of Peace. Then I started working at a library and found it again. And though I work in the loudest library known to man, the threat of Silence exists around every stack of books. 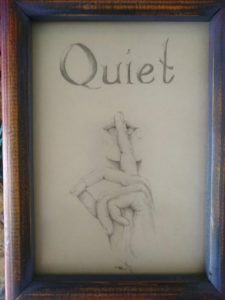 And as such, the need for Quiet, which has been drilled into us all since our first encounter with story hour and the idea of “check out,” is housed within, looming large even amid the chaos. Aging has brought the Quiet, which descends at night. As much as I love it during daylight hours, I loathe it’s existence in the deep dark sky. It’s not Peace. It’s a virtual presence of a Something Frightening I can’t quite pinpoint. Now I have panic attacks and wars within myself to meditate, find my breath, all that. I say a little prayer and fall asleep to reluctantly greet the dawn. Every year it worsens, this fear within unsettled air. Aside from lamps blazing all night, and prayer, I have no tools for combat. I feel like I’m in the middle of youthful rest and elder forgetfulness, so that fear is only a companion; a constant, whether it’s feared or not. A conundrum for which I have no solution. So if you’re driving by and see the light on in my window, it’s just me, combating an unseen villain, probably scrolling the Netflix queue and waiting for dawn. This entry was posted in Prairie Life and tagged #worthwritingoutloud, aging, peace, quiet by michelleferg. Bookmark the permalink.